Where great science meets great teaching. At just fourteen chapters, Psychology: Core Concepts provides rich coverage of the foundational topics taught in most introductory courses. 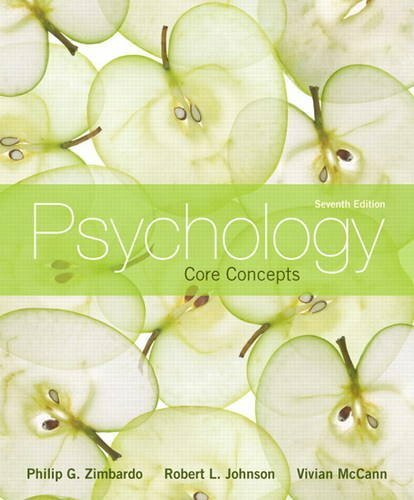 Psychology: Core Concepts focuses on a manageable number of core concepts (usually three to five) in each chapter, allowing students to attain a deeper level of understanding of the material. Learning is reinforced through focused application and critical thinking activities, and connections between concepts are drawn across chapters to help students see the big picture of psychology as a whole. The 7th edition features an enhanced critical thinking emphasis, with new chapter-opening "Problems" and new end-of-chapter critical thinking applications that promote active learning. Improve Critical Thinking – Pedagogical features are designed to help students learn the problem-solving skills and critical thinking techniques of a good psychologist. Explore Research – Current research reflects the most up-to-date psychological theories and applications. Understand Culture and Diversity – Cross-cultural, multicultural, and gender research is woven throughout the text to reflect the increasing diversity and global reach of psychology. Support Instructors – An Instructor’s Manual, Test Bank (both print and computerized), Interactive PowerPoints, Telecourse Videos, and a Telecourse Study Guide provide instructors with the ultimate supplements package. Philip Zimbardo is internationally recognized as the “voice and face of contemporary American psychology” through his widely seen PBS-TV series, Discovering Psychology, his classic research, The Stanford Prison Experiment, authoring the oldest current textbook in psychology, Psychology and Life, in its 18th Edition, and his popular trade books on Shyness in adults and in children; Shyness: What it is, what to do about it, and The Shy Child. Past president of the American Psychological Association, and the Western Psychological Association. Zimbardo has been a Stanford University professor since 1968 (now an Emeritus Professor), having taught previously at Yale, NYU, and Columbia University. He is currently on the faculty of the Pacific Graduate School of Psychology, and the Naval Postgraduate School at Monterey, CA. He has been given numerous awards and honors as an educator, researcher, writer, and service to the profession. Recently, he was awarded the Vaclav Havel Foundation Prize for his lifetime of research on the human condition. His more than 300 professional publications and 50 books convey his research interests in the domain of social psychology, with a broad spread of interests from shyness to time perspective, madness, cults, political psychology, torture, terrorism, and evil. Zimbardo has served also as the Chair of the Council of Scientific Society Presidents (CSSP) representing 63 scientific, math and technical associations (with 1.5 million members), and now is Chair of the Western Psychological Foundation. He heads a philanthropic foundation in his name to promote student education in his ancestral Sicilian towns. Zimbardo adds further to his retirement list activities: serving as the new executive director of a Stanford center on terrorism -- the Center for Interdisciplinary Policy, Education, and Research on Terrorism (CIPERT). He was an expert witness for one of the soldiers in the Abu Ghraib Prison abuses, and has studied the interrogation procedures used by the military in that and other prisons as well as by Greek and Brazilian police torturers. Noted for his personal and professional efforts to actually 'give psychology away to the public', Zimbardo has also been a social-political activist, challenging the U.S. Government's wars in Vietnam and Iraq, as well as the American Correctional System. His new book has been a New York Times bestseller: THE LUCIFER EFFECT: UNDERSTANDING HOW GOOD PEOPLE TURN EVIL (Random House, 2007; see www.lucifereffect.org). Robert Johnson, Ph.D., taught introductory psychology for 28 years at Umpqua Community College. He is especially interested in applying psychological principles to the teaching of psychology and in encouraging linkages between psychology and other disciplines. In keeping with those interests, Bob founded the Pacific Northwest Great Teachers Seminar, of which he was the director for 20 years. He was also one of the founders of Psychology Teachers at Community Colleges (PT@CC), serving as its executive committee chair during 2004. That same year he also received the Two-Year College Teaching Award given by the Society for the Teaching of Psychology. Bob has long been active in APA, APS, the Western Psychological Association, and the Council of Teachers of Undergraduate Psychology. Hamilton, Vivian McCann; Zimbardo, Philip G.; Johnson, Robert L.